Bryan, CEO & Founder, has been involved with Marketing & Promotions and Volunteer Management in the Charlotte area for more than 20 years. Mainly focusing on Corporate Event Planning, Sports Consulting, and Social Media for Events and Volunteer Coordination. Bryan’s hobby and passion is working with local non-profits to raise funds through social events and sporting venues while staying sustainable. Upon graduating from Appalachian State, Paschal moved to Atlanta and was named Interpreter for Argentina during the 1996 Olympics. After a short stint in Atlanta, Paschal moved to Charlotte and started Charlotte Sports Connection in 1999 (Charlotte’s largest adult organized sports leagues and social club). After successfully growing Charlotte Sports Connection from a participant level of zero participants to 25,000, Paschal sold the business to Sports Warehouse, LLC. Sports Warehouse adopted the Sports Connection name and now operates all company entities under the name of Sports Connection & Sports Link. 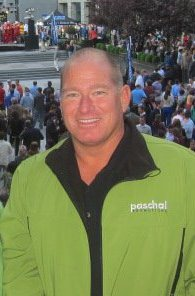 Paschal has branded a company name that is easily remembered by all Charlotteans. Paschal’s largest event is the Wells Fargo Championship of which he is serving his 14th year on the board as the Assistant to The Tournament Coordinator. Additional significant contributions to the Charlotte community include Alive After Five, Music at Morrison, Village Tavern @ 5, and MetLive Music on the Greenway at the Metropolitan. Meredith Brady, Events Manager at Paschal Events, has been with Paschal Events since March 2014, assisting with planning and event management, recruiting and coordinating volunteers, Social Media management, and much more. Upon graduating from Appalachian State in 2011 with a degree in Marketing, Meredith worked in sales for a technology company. In February 2014, Meredith enrolled in a Meeting and Event Planning continuing education course at the University of North Carolina at Charlotte where she met Bryan Paschal, CEO of Paschal Events. Soon after completing the program, she began interning with Paschal Events and later became a full-time employee. We wouldn't be able to do what we do without our extremely talented interns! Each intern brings different opinions to the table which keep us on our toes at all times.